Condition 2: and and . In this post, we are going to use the concept of similarity to prove the Side Splitter Theorem. 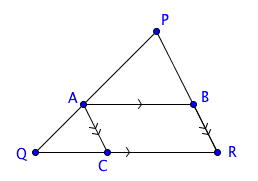 The Side Splitter theorem states that if is any triangle, and is drawn parallel to , then . If is any triangle, and is drawn parallel to , then . and by the Parallel Line Postulate. Note that is parallel to and acts a transversal. 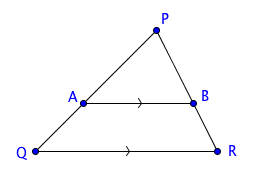 Now, by AA Similarity, triangle is similar to triangle . But notice that is a parallelogram (why? ), so it follows that . Therefore, which is what we want to prove.